KSC Hardboard Pegboards are constructed of the highest grade of MDF or Masonite on the market. These economical 1/4 thick tempered hardboards are great for organizing any space. Their standard peg hook holes allow you to use any standard hook or accessory to customize your organizational needs. Great for use in factories, offices, retail space, workshops, garages, kitchens, tradeshows, and more. Comes in sizes: 2'x2', 4'x4', 4'x8' - All peg holes are 9/32"
Expanding Hollow Wall Anchors for use in wallboard, drywall, sheet rock, gypsum board, plaster, and paneling. Fits 1/8" to 1/2" thick wall. How many fasteners do you need? 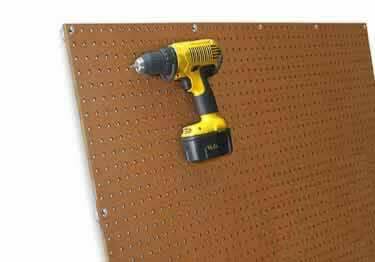 I am looking for a 4'x 8' pegboard, with a aluminum frame. I was wandering if you had one. KSC Hardboard Pegboards are constructed of the highest grade of MDF or Masonite on the market. These economical 1/4" thick tempered hardboards are great for organizing any space. Their standard peg hook holes allow you to use any standard hook or accessory to customize your organizational needs. Great for use in factories, offices, retail space, workshops, garages, kitchens, tradeshows, and more. Great for garages, workshops, retail stores, factories&more. Comes in a variety of styles, colors,&sizes.